Ozhotels is a group of independently owned and non-related hotels, resorts and serviced apartments situated in the holiday destination of Maroochydore on the Queensland Sunshine Coast. Ozhotels allows you to deal directly with the apartments and resorts, therefore giving you the best possible rates for this Maroochydore accommodation. 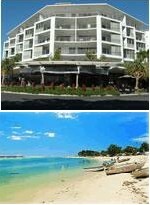 So book your next resort or apartment holiday accommodation in Maroochydore online and get great discount rates. The main commercial centre of the popular Sunshine Coast region in Maroochydore and it provides a central place to holiday for all types of travellers. For this reason Maroochydore has lots of places to stay for couples, families and groups, ranging from fully self contained holiday apartments and resorts through to luxury hotels and budget motels. This wide variety of Maroochydore accommodation makes finding the ideal place to stay a difficult and time consuming task, which is why many people like to use the free services of an expert like OzHotels. Doing this allows them to compare hundreds of different properties that are situated all over Maroochydore and the surrounding region, in order to find the perfect one for their needs and travel budget. The main advantages of booking online with and accommodation expert like OzHotels is that you can book your travel up to 12 months in advance and that you will be able to get an extra discount off the already cheap rates the longer that you stay in Maroochydore. Pacific Horizons Resort Apartments is one of the best value for money family accommodation in Maroochydore and the Alexandra Headlands. 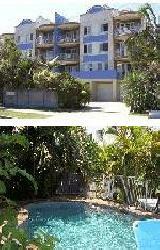 The Pacific Horizons Resort is also one of the friendliest resorts on the Queensland Sunshine Coast. The rooms at the Pacific Horizons Resort consists of family sized 2 bedroom full y self contained apartments at budget prices. It is the ideal base from which to explore and enjoy all that the fantastic Sunshine Coast has to offer. Located nearby to one of the best surf beaches in Queensland a stay at the Pacific Horizons means that the whole family will appreciate the unique holiday experience. With its own landscaped pool areas and BBQ facilities the Pacific Horizons Apartments are tastefully decorated and have earnt a reputation as the friendliest resort on the coast. If you are looking for a romantic getaway, a well earned break or a family holiday then this Maroochydore accommodation is the place for you. The Top Spot Motel is located in the heart of Maroochydore and offers budget style studio & 1 bedroom self contained apartments. When you stay at the Top Spot Motel you will have easy access to public transport, the local RSL, hotels, restaurants, shopping, post office and the cinema. 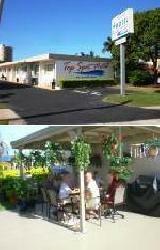 The Top Spot Motel in Maroochydore is close to everything that the city has to offer, as well as having a numerous guests facilities and services including direct internet access, disabled facilities, faxing facilities, free car parking, guest laundry, tour desk, bbq, garden, baby cots available and babysitting service. For friendly customer service, discount rates, comfortable accommodation and a central location on the Sunshine Coast, stay at the Top Spot Motel. If you are after quality apartments on the Sunshine Coast with exceptional discount rates available for week long holidays then stay at the Rovera Apartments Maroochydore. The Rovera Apartments offers luxury holiday accommodation including one, two and three bedroom fully furnished apartments with all of the facilities that you need to make sure that your holiday is comfortable and memorable. This budget Maroochydore accommodation is perfectly situated overlooking the beautiful Maroochy River and 100 meters to the Maroochydore surf beach. The Rovera Apartments Maroochydore offer you extremely affordable apartments in the heart of the Sunshine Coast suburb of Cotton Tree. When you stay at the Rovera Apartments you can take a morning dip in the resort style swimming pool or check out all of the Sunshine Coast tourist attractions which are only a short drive away.